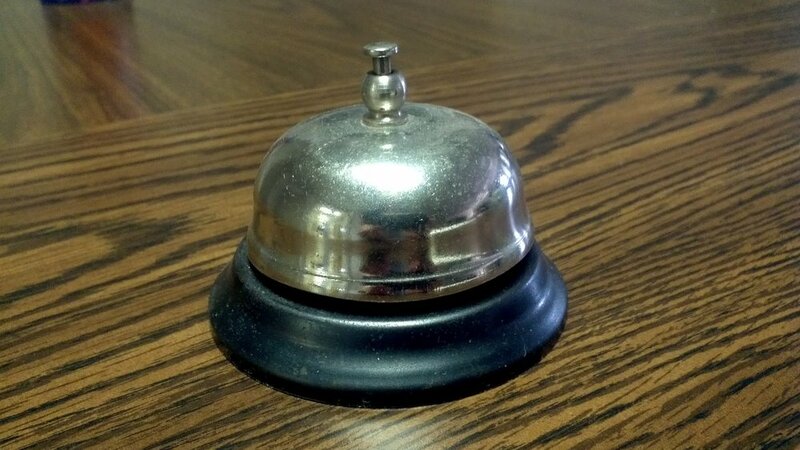 The director said the bell would stay on the circulation desk. Brenda complained that someone was always there, but the director said the bell would stay. Brenda pouted and stood, arms crossed, glaring at the little metal object. I kept out of it. Easier that way. As the circulation librarian, Brenda did have a limited sovereignty over her desk. At the reference desk, I would have taken the bell and hid it behind something. A display on bells, maybe. Or I would have wrapped a little tape around the clapper. When a patron hit the bell, there would be a sound but not the loud ring. The director wanted it there, though, so Brenda let it sit. She dared anyone to ring it, staff and patrons equally. The first person to ring it was a college student. He walked up to the desk and slapped it. "Yes," Brenda said, sitting two feet from the bell. "I got this notice about a book, but I totally brought it to the other branch or whatever," the student said. The second bell ringer was a little old lady with purple hair. Brenda watched her walk to the empty desk and hurried but the fragile old hand clapped down. Her paper thin skin did nothing to dull the sound. Brenda had been shelving books six feet away on the New Books shelf. She smiled and set down the pile in her hand and asked how she can help. "I'm looking for the new books," the little old lady said. Brenda sighed and helped the lady. They sat talking under the large sign that read "New Books" Brenda had been standing under moments before. Brenda developed a twitch the second day. Story time let out and a line of parents stretched out ten deep. Each mom and dad held a dozen board books each. The children tall enough to reach the counter all found the bell. Some parents think their children can do no wrong. They allowed the bell to ring, small hands finding the little metal plunger. Laughter, plunge, laughter. The director came down. He watched as Brenda and the library assistant helped the parents. He watched as the bell rang through the clear morning air. He watched and made small talk. After, he said, "That bell, I don't think we need it." Brenda's eye twitched. She said, "Thank you." The library assistant moved slow. She stretched a hand across the desk, past the director and Brenda's twitching eye. The library assistants hand closed around the bell and pulled it quietly away. The library director smiled. Brenda smiled, eye twitching. Then she went to the library work room, out the back door, to her car. Brenda turned on the car, chose a CD, and blasted speed metal into the fall afternoon while staring straight ahead willing her eye to calm.